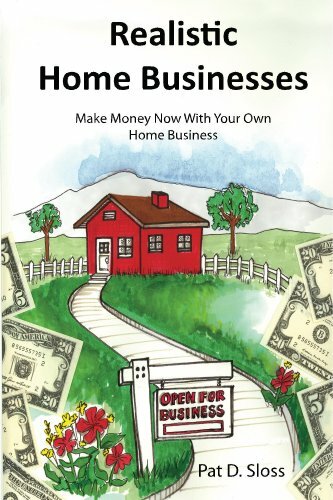 about this book: Realistic Home Businesses will help you select and start your home business. Many of the businesses listed can be started for little money and they range from low to high tech. I wrote this book because I knew many people out of work and all they could think of was going back to work in their previous field. Some of their jobs will never be open again in their lifetime, but they are having a hard time processing that fact and looking for something else they might be able to do. This book details over 80 businesses and niches. Even if a reader doesn’t select the exact business I list, it should help someone come up with a niche business that will be perfect for them. For others, some of the businesses listed can be done for extra money until the right thing for them comes along. You can literally start some of the businesses in one day. I chose the title Realistic Home Business – Make Money Now With Your Own Home Business, since the businesses I included are very realistic and not stuffing envelopes or scam businesses. I have either previously or currently been involved in 28 of the businesses listed. Friends and acquaintances are involved in the remainder of the businesses. I knew the concept of what I wanted for the cover and had bits and pieces of it in mind but I am not an artist. I called on one of my childhood friends, Jay Peck, who is an artist. I gave him an idea of what I wanted and he ran with it. I love what my friend did when he created the watercolor for my cover and he added the money on the sides, which was the perfect touch. It took me 6 months to write the book and many long days for the research. It all starts with making sure your personality fits working from home and for yourself. The next step is to find the work that matches your skills and passions. Many websites, equipment sources, and even professional organizations are listed for people to use for specific businesses. There are tips on how to keep your social security number private when you own a business and how to structure your new business. While I have previously written more than 30 operating, maintenance, training, and marketing books or courses, this was my first I could publish as a book with my name on it. It was a lot of work but I am hoping my readers will get something worthwhile from it. I would love to hear from a reader someday that my book inspired them to start a new business and it is a huge success.